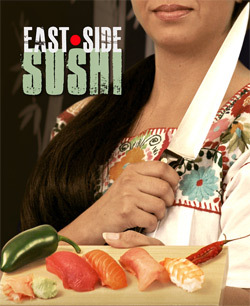 East•Side Sushi introduces us to Juana, a working-class Latina single mother who strives to become a sushi chef. Years of working in the food industry have made Juana’s hands fast—very fast. She can slice and dice anything you throw at her with great speed and precision. Forced to give up her fruit-vending cart in order to find a more secure job, Juana lands a position as a kitchen assistant at a local Japanese restaurant. It is there she discovers a new friendship and a whole new world of cuisine and culture, far-removed from everything she has ever known. While working in the restaurant’s kitchen, Juana secretly observes the sushi chefs and eventually teaches herself to make a multitude of sushi. Her creativity sparked, Juana’s re-ignited passion for food drives her to want more from her job and her life. Eventually she attempts to become a sushi chef, but is unable to because she is the “wrong” race and gender. Against all odds, she embarks on a journey of self-discovery, determined to not let anyone stop her from achieving her dream. San Francisco's one and only Food & Farm Film Fest offers a place for the food and art worlds of San Francisco to collide. We’re in this to have fun, as well as ask tough questions about our food system. The festival is a celebration of food and farming and film, as well as a challenge to our ideas about how we think about food and farms. All proceeds from the Fest benefit our Cooking Matters program.